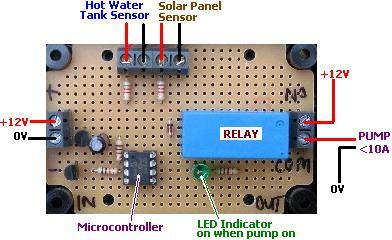 Buy of SOLAR PUMP CONTROLLER WITH RELAY. This circuit is an alternative to our popular Solar Pump Controller Circuit (described in the article: Solar Water Heating Pump Controller) supplied with a fitted relay. NEW 2013 – This 2009 controller is now available at a lower price. Our new improved for 2013 solar water heating pump controller with relay is now available here: buy 2013 Solar Pump Controller with Relay with many added user requested features and improvements. 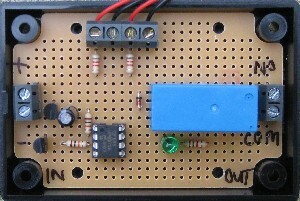 This design of solar water heating pump controller is based around a PIC microcontroller – to all intents and purposes a computer-on-a-chip. This has given us the flexibility to produce a pump controller which meets the exact needs of our customers. The operation of our standard version is described below, however we can programme the microcontroller to operate according to different specifications if required. (Contact details are provided below for bespoke pump controller enquiries). Two LM335Z precision temperature sensors are provided pre-soldered to 100mm insulated leads. The soldered joints are covered with heat-shrink tubing to prevent short circuits and protect against corrosion. One temperature sensor is for the solar water heating panel, and the other for the hot water tank. Some terminal strip is provided to enable you to connect the sensor leads to the long cables (not included) which you will use to connect your solar heating panel, water tank, and this control circuit. The first temperature sensor should be stuck to the copper pipe just where it leaves the solar heating panel, the second should be stuck to the outside of the hot water tank underneath the insulation. We recommend that you use heat sink adhesive (more usually used to stick heat sinks to the tops of processors in computers) to attach the sensors to the pipe and tank. This type of adhesive conducts heat very well ensuring accurate temperature readings, and it will hold the sensors securely in place. The microcontroller monitors the temperature of solar water heating panel and the hot water storage tank. Basically, if the panel is hotter than the tank we want the pump to switch ON – so we can increase the heat of the water in the tank; if the tank is hotter than the panel then we want the pump should be OFF – we don’t want to cool the water in the tank by pumping from the solar panel. In reality, things are a little bit more complicated. For example, when the temperature of the tank and panel are nearly equal, there is the risk of the pump being switched on and off rapidly – a sure fire way of damaging the pump and also wasting energy. Therefore, the controller is programmed to turn on the pump only if the temperature of the panel has been hotter than that of the tank constantly for 30 seconds. Similarly, the pump once switched on is kept on for a minimum of 20 seconds so a sudden (unlikely) drop in panel temperature will not cause the pump to switch immediately off. A 12V relay is fitted to the circuit board through which a suitable pump can be switched. The relay is rated at 10 Amps – corresponding to a pump with a peak power rating of around 120 Watts at 12 VDC. An LED bulb gives a visual indication of whether the relay switch is closed. Above is a diagram to show how this controller circuit should be connected into a solar water heating system. Although the fitted relay is rated for use with 240VAC mains electricity, this circuit should not be used directly to switch a mains powered pump (for example the circulation pump from a mains powered boiler). If you intend to use a mains powered pump, then a secondary relay on a completely separate (correctly earthed and insulated) circuit board must be used. Consult with a qualified electrician before attempting this sort of work. If you require a pump controller which operates in a way different to this above described standard version, please contact neil@reuk.co.uk with details of your exact requirements.